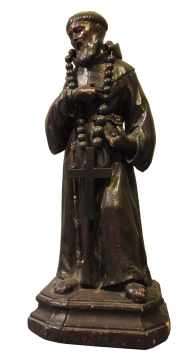 18th-century Italian carved black wood figure of a monk with a rosary. You are here: CollectionsOnline / 18th-century Italian carved black wood figure of a monk with a rosary. This figure stood in the Monk's Parlour in Soane’s day and was described by him as a portrait of ‘Padre Giovanni’ – the imaginary medieval occupant of this ‘Monk’s Parloir’. Of course the name ‘Padre Giovanni’ is a play on Soane’s own name, meaning ‘Father John’ and so the statue adds to the humour of the Monk's Parlour's intriguing mock-Gothic interior. Soane’s friends seem to have enjoyed his identification of himself with his fictional hermit – Nancy Flaxman even sent him a set of rosary beads as a gift, in a small wooden box with an inscription to ‘Padre Giovanni’.